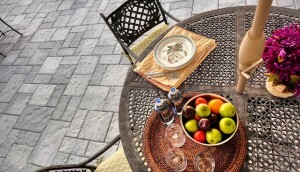 How to Build a Paver Patio! Building a patio out of paving stones or “interlocking concrete pavers” can be a beautiful and valuable addition to your home and can offer a durable, low maintenance area for you and your family to enjoy. You may opt to hire a professional mason but with these 10 steps you can install a paver patio all on your own! 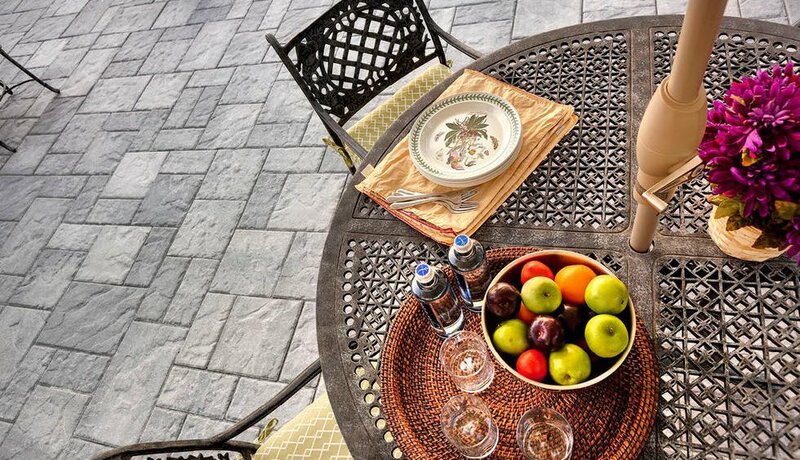 Here are 10 Steps to help you build your very own outdoor paver patio! 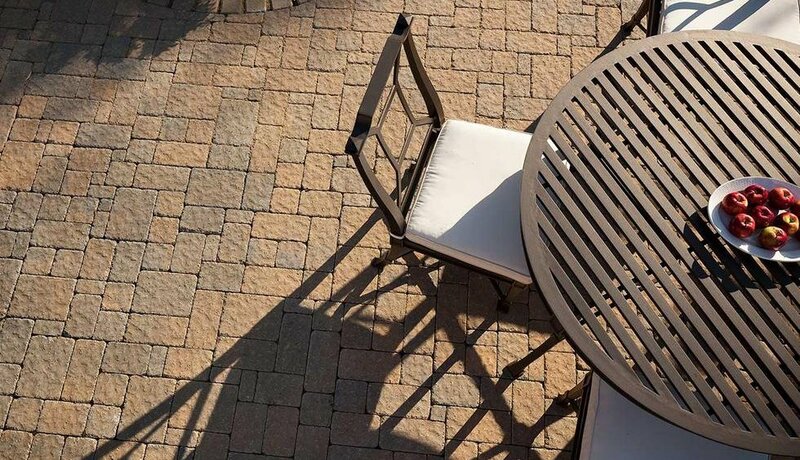 Determine what kind of paver you would like to use for your patio. There are many paving stone manufacturer’s to choose from that offer pavers in many different shapes, colors, sizes, and cost. Did You Know? 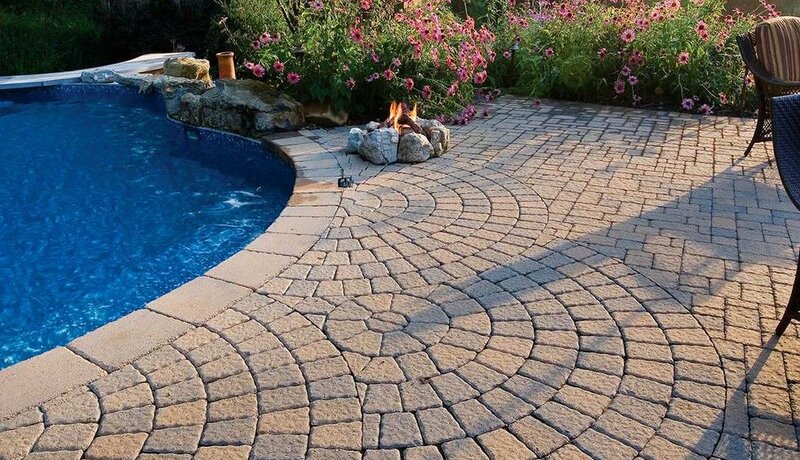 TLC Supply carries only the highest quality pavers backed by a lifetime manufacturer’s guarantee. 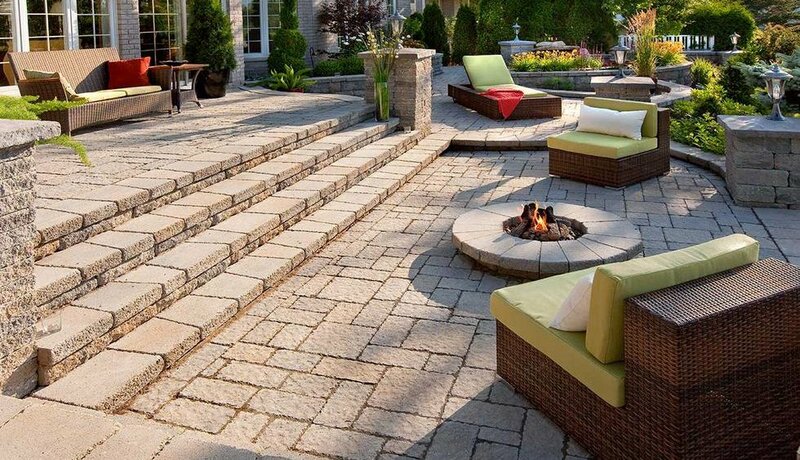 During this stage you will also want to determine the size, length, and design of your patio. Next, calculate your square footage to determine how much material you will need by multiplying length by width. You may even prefer to make a pattern.Research your selected paver manufacturer to see what patterns you can make with their pavers. Some patterns will require more or less pavers. Call TLC Supply for help in determining the amount of pavers you may need. Clear any plants, roots, large rocks, or existing material that may interfere with the patio or cause unevenness. Use chalk line to mark out the area and if you are doing a curved design you can use a garden hose to mark the shape you wish to take and trace with chalk or paint. Then drive stakes into the ground following your laid out sketch. 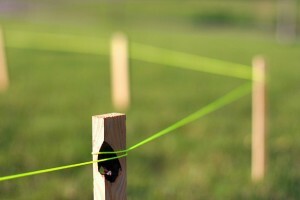 Wrap string around the stakes to outline the perimeter of the patio. Be sure to keep the string level so that your patio will be leveled. Tip: It is actually the law to call your local utility company or “Dig Safe” and have them identify any buried gas, water, or electrical lines before you start digging. Measure the thickness of your paver then dig a depth of 6”-8” below the bottom of the paver. This excavation should also allow room so that the pavers end up being flush with the ground. To avoid puddling you will want to slightly slope the patio in one direction so water can run off. Tip: You can lay boards across the area and use a level to help you determine the slope. Fill the sunken area with 4”-6” of base material such as ¾” dense grade. This will help provide a solid base and aid in proper water percolation into the soil. Tip: Fill the area with dense grade in 2” increments and compact with a machine plate compacter. This will ensure that the material is tightly packed. Pour another 2” of dense grade and repeat the steps until everything is compacted evenly to a depth of about 6”.You can even spray the area with water to help keep the dust down when tampering. 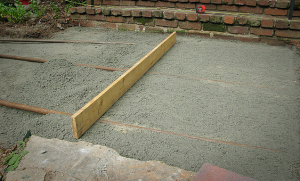 Apply a 1”-2” layer of concrete sand over the dense grade and compact it. Tip: We recommend concrete sand rather than mason sand because it will provide more stability and assist in water percolation. Now lay down two pieces of round level piping and push it a little into the sand. Depending on the width of your patio you may need to use a longer or shorter pipe. 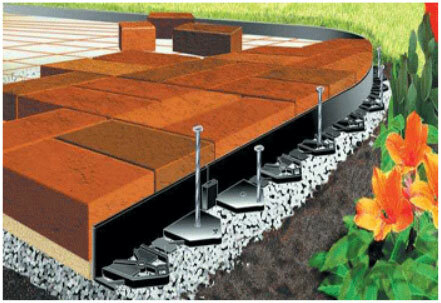 Doing this is going to help ensure your base is level before applying the pavers. Now spread more sand to make sure it is flush with the pipe. You can use a 2 x 4 to screed the sand to a smooth surface. If you cut a 1 3⁄4-in.-deep notch at each end of the 2 x 4, you can rest the notches on the edge restraints while you pull the 2 x 4 across the sand. Once the area is leveled, gently remove the pipe and fill the void with sand and smooth the area out. 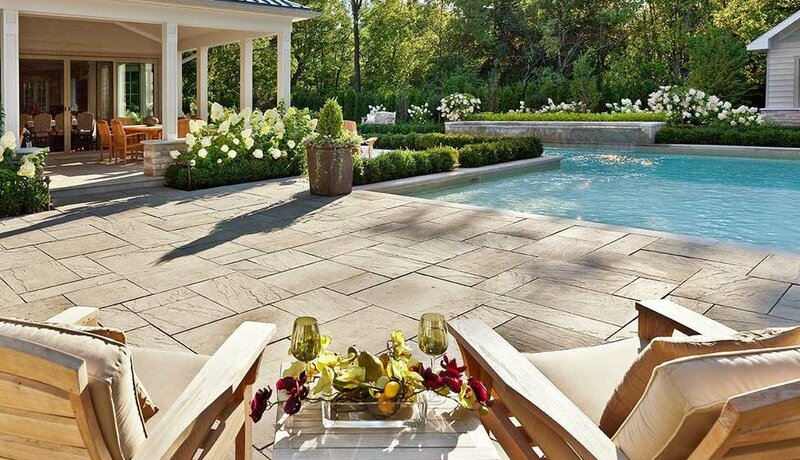 Start laying the pavers in your desired pattern. Keep the pavers close together and gently press them down with a rubber mallet. 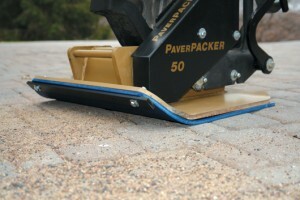 If a paver is uneven you can tap it down more into place. 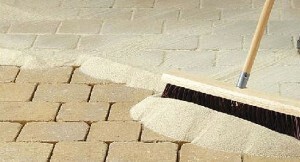 If a paver is too low you can add a little sand to the area and rest the paver on top. To better fit pieces you may need to use a wet saw or a paver guillotine to cut pieces to the desired measurement. Add plastic edging to the sides to define the perimeter of the walkway and to hold the pavers in place. Hold the edging in place with spikes. We recommend B.E.A.S.T. Plastic Paver Edging for its strength and flexibility. B.E.A.S.T. edging comes in 8 ft. sections and can be nailed in with 10” or 12” spikes. This edging is also made from recycled material and it allows for the growth of vegetation. So far you should have something that looks like this! When you finish laying the pavers pour polymeric sand over the top and gently sweep the sand over the whole area to fill the joints. Tamper the top to ensure compaction. You may need to add more sand and fill the joints again. When the joints are compacted and filled you should sweep away any excess sand with a broom. We highly suggest lightly blowing over the area with a leaf blower to ensure that the sand is off the surface of the pavers (polymeric sand will harden when wet). Then you will want to mist the patio with water to secure the sand and pavers. Tip: We recommend using polymeric sand over mason sand because it contains binders that help maintain a firm bond between the pavers which in turn help to secure them in place. Fill in any missing areas with topsoil or grass. The roots of the grass will grow through the holes in the edge restraint to further lock it in place. You also can also add cobble stones or paver edging and even plant flowers or shrubs for a finishing touch to your patio. Tip: Decorate your patio with furniture or even add a pergola, an easy to assemble fire pit, or you can even veneer the front of a grill to create an outdoor kitchen! The possibilities are endless in your new outdoor living space. Fill it with things that make you and your family happy. Recommended: We highly recommend sealing your pavers with a breathable sealer to help prevent any staining. *You can always follow this guide to install a paver walkway as well. 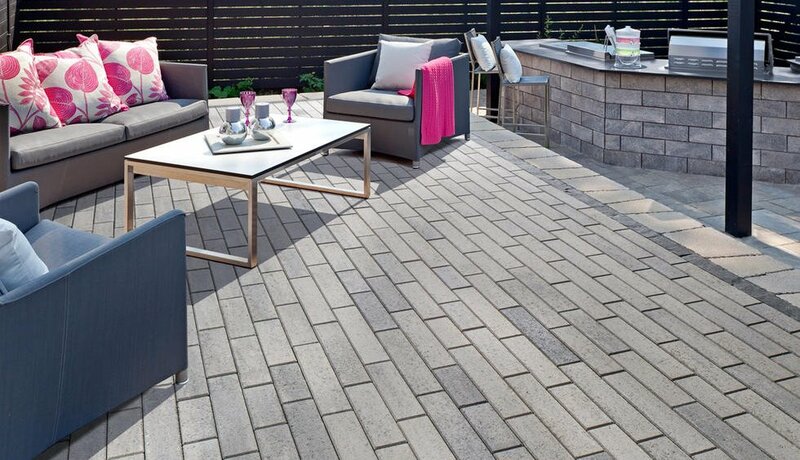 TLC Supply carries a wide selection of premium pavers from Techo Bloc as well as from Belgard, Cambridge Paving Stone, and Genest (coming soon!). Please visit our website to see even more hardscape and masonry products ranging from bluestone,granite,brick,natural stone,block,sand, and cement! If you liked this page be sure to share it with all your friends! And for even more inspiring paver patios as well as backyard DIY projects and outdoor entertaining ideas follow us on Pinterest! WAIT! Before you go check this out! You may even like our post 10 Unique Hardscape Ideas! We are happy to answer any of your project questions, just give us a shout! Send us an email to info@tlcsupply.com or leave your comments below. “Best Price, Best Advice” -TLC Supply,Inc.